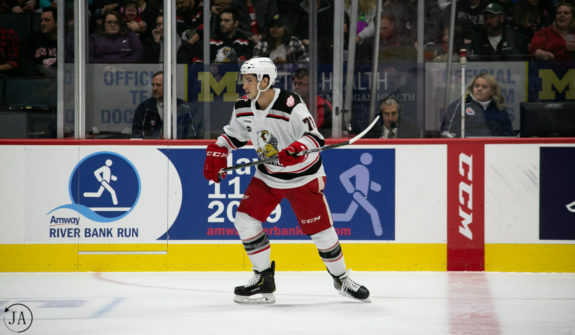 Turner Elson and Matt Puempel are a threatening force for the Grand Rapids Griffins. As entertaining as they are talented, they seem to have found their niche on the same line. Both skaters are considered veterans in the league. They both have been a part of the AHL for six and eight seasons and each have NHL experience under their belts. Though neither has made a long-lasting stand in the NHL, their time in the AHL has been nothing short of productive. Grand Rapids is now reaping the benefits of their cumulative experience and energetic styles. 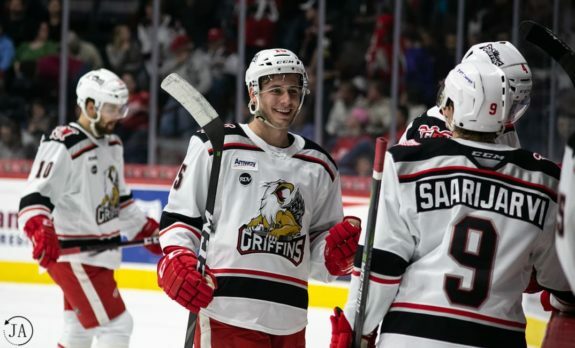 So far, the Griffins have struggled to put together a winning streak. As they enter a homestand this coming weekend, Grand Rapids will look to their scorers to lead the way; Elson and Puempel being among them. His ability to drive the net is much more noticeable now, even in comparison to last season. Elson has been putting in the work and his pairing with Puempel has only amplified his existing ability. Puempel has been around awhile. 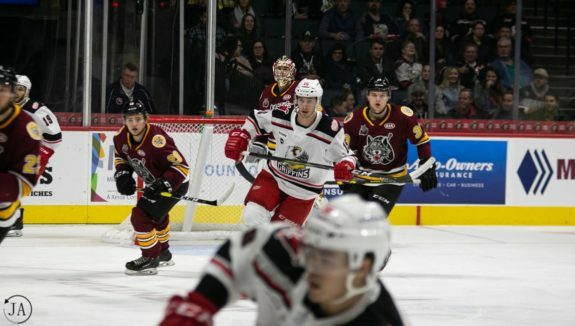 Grand Rapids found themselves on the winning side when they acquired Puempel from the Hartford Wolf Pack. Instantly finding his place with the team, he tallied 54 points in 57 games. He is what would be considered calm, cool, and collected. Rarely unhinged on the ice, Puempel easily sweeps by the defense and stuns goaltenders. He quickly became an essential part of the team throughout the 2017-18 season and most assumed a re-signing was inevitable. His production and overall definitive style of play lead people to believe the Detroit Red Wings would be shoving a new contract at him before the final horn sounded for 2018. That was not the case, however. Holding off all summer, it seemed no one could reach an agreement, though both were anxious for one. “Obviously, (I) was a restricted free agent, so both sides wanted to get something done,” told me in a post-game interview. Ever-composed, Puempel didn’t lose focus, however. Training intensely along with the rest of his teammates in the off-season, his experienced overruled any underlying anxiety. A contract renewal eventually came, and Puempel has made it count. Remaining fixed on the NHL as his ultimate goal, he has continued his point streak in hopes of making the jump. Having six points in eight games already this season, he’s on track to repeat his 2017-18 success. I’ve been intrigued by both of the skaters over the last season. The puck possession styles and speed are similar on the ice, but beyond that, they’re quite different. Elson is boisterous and exuberant which shows in his skating. He’s quick-footed and edgy – driving at the puck with speed that would level most. Puempel is relaxed but intentional. He’s a focused skater that makes few errors in his stride which makes him an impact player. Off the ice, he’s calm and straight to the point. When skating together, however, the two personalities are almost inseparable. They flow and have obvious chemistry. Puck placement and communication are key in hockey, and Puempel and Elson do it very well. Puempel’s approach to the chemistry is much more diplomatic but no less accurate. “Benny (Ben Simon) works so hard with behind-the-scenes stuff,” he told me post-game. “It’s been huge knowing the head coach. We’re still a work in progress for sure… we’re still working towards to the right goal.” Elson and Puempel will continue to work on the same line according to a conversation I had with Ben Simon, as long as the production keeps coming. They are a fast duo and can work with anyone as their third linemate. Both have adaptable games that are perfect for playmaking and leading rushes. What Does This Mean for Grand Rapids? Grand Rapids is slowly taking shape and the lines are creating chemistry. It won’t be long now till the youngsters follow suit and ideally, launch Grand Rapids into a win streak. Leading the way will be Turner Elson and Matt Puempel.